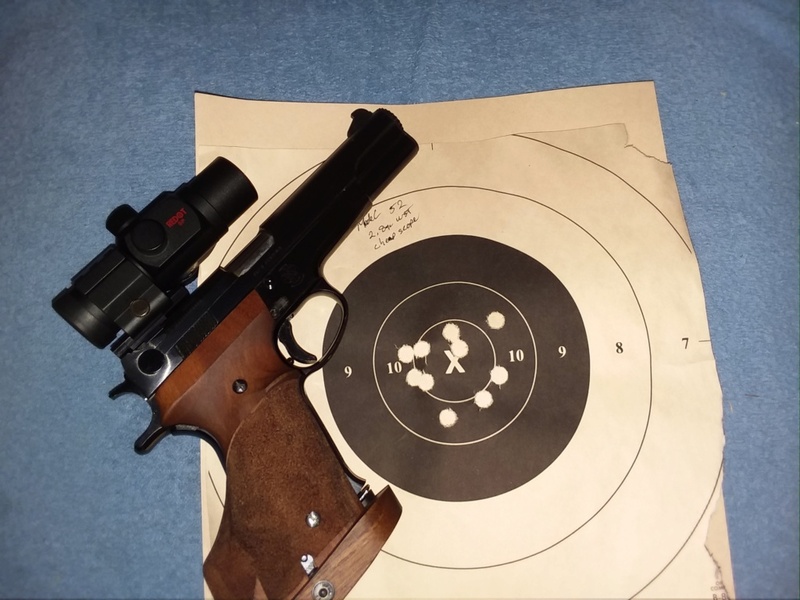 I shot my S&W 52 on Friday, and came to the realization that although this gun has some of the best iron sights available (at least in my book), it is time I shot it with a red dot, as I do my Model 41. On the 41 I have an older Matchdot, which I like very much. I recently bought a Matchdot II, which I might transfer off of another gun. I have been looking at the BME rail that mounts on the weight slots of the gun, which would not only be a no-drill solution, but will add a little forward weight to the gun, which I think it needs. Is this a good solution, or is their something better? I don't want to drill the slide, and I would like a mount that I can install myself. I am also concerned that a slide mounted dot might interfere with ejection and/or function of the slide. I would recommend having someone install a frame mount though. If you are gonna mount a dot might as well do it the right way. The bottom one a model 52 jerry did. David Sams would probably be able to do it. I have that BME mount. It works well. However I took it off because as you said, they are really great iron sights. It did not leave any marks on the gun and was very stable. BME mounts do not require you to drill & tap holes . A plus as far as resale value . Factory sights are very good for target . I use the BME mount that replaces the rear sight . Go with the 1" UD & 7lb recoil spring so you don't slow the slide down too much . Barrel weight is also a good addition , factory are pricey & Don Weber makes one that's half that price . I also use the BME rear sight mount. Easy to do. The rear sight on the 52 will practically come out with thumb pressure. I've used full sized and Micros on it. Currently have a Vortex on pistol and liking it. LSM 124 wrote: I shot my S&W 52 on Friday, and came to the realization that although this gun has some of the best iron sights available (at least in my book), it is time I shot it with a red dot, as I do my Model 41. On the 41 I have an older Matchdot, which I like very much. I recently bought a Matchdot II, which I might transfer off of another gun. I have been looking at the BME rail that mounts on the weight slots of the gun, which would not only be a no-drill solution, but will add a little forward weight to the gun, which I think it needs. Is this a good solution, or is their something better? I don't want to drill the slide, and I would like a mount that I can install myself. I am also concerned that a slide mounted dot might interfere with ejection and/or function of the slide. The BME mount that fits in the weight slots is a good solution. I have that on my model 52. It does put the scope up pretty high though, if that bothers you. I never noticed any weight slots on my 52 no dash. Thanks guys, for all your suggestions! Chris, you have some kick-axx bullseye guns. I wish Jerry were still around, I might have him do some work on mine. As it is though, I am more of a wanna-be bullseye shooter - I don't put enough time or money in it to get very good. Especially time! Instead, I have a honey-do list that is as long as the long-line is far. Not sure which route I will take, but I guess I will order a BME mount in the near future. Len, the weight slots are located between the dust cover and the slide, just forward of the trigger guard. Mike Myers has posted a picture of his 52 in one of his threads with the weight on it. I have heard that some of the very late production guns did not get the slots, and maybe that holds true for the early ones as well. Mine is a 52-2. The weight slots were not machined into the original 52-no dash. Memory says the weights were offered with the 52-1. The 52-1 is where the weight part number first appeared on the parts/owners list. I've read the comments and checked the BME Web page, but seeking some additional input. 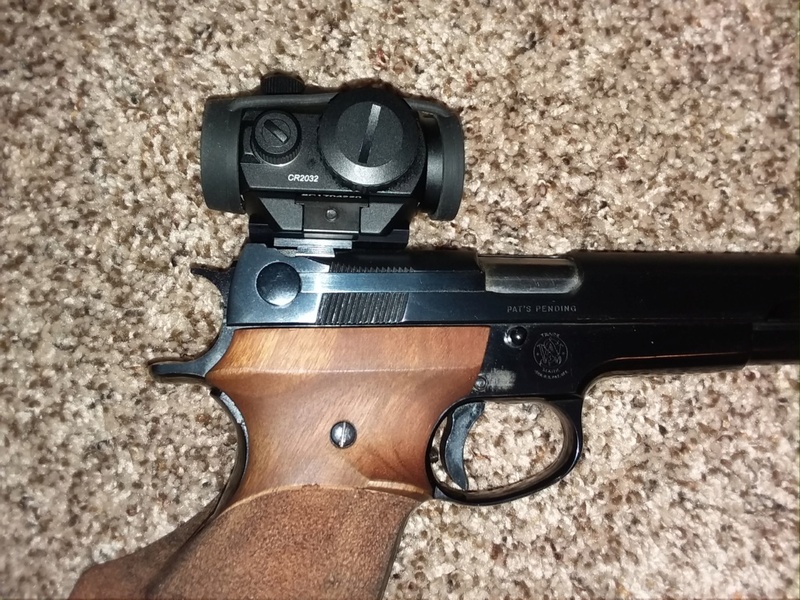 I particularly prefer the Model 52 BME mount that replaces the rear sight as some other 52 owners' have expressed that they do not want a slide mount and in the past, I've had a grip mount on two separate 52s and was unsatisfied. So, based on my positive experience of owning several Ultradots and the cost spread between them and Aimpoint, I'd opt for a Ultradot HD-Micro. Would appreciate experiences and recommendations for a BME 52 rear sight mount, with the Ultradot HD-Micro on top? LSM 124 wrote: Thanks guys, for all your suggestions! LenV wrote: I also use the BME rear sight mount. Easy to do. The rear sight on the 52 will practically come out with thumb pressure. I've used full sized and Micros on it. Currently have a Vortex on pistol and liking it. Thanks for the info. I'm in the same boat as OP: I'm looking for a scope mount for my newly-acquired Model 52. Though, mine's a 52-1. I'm not inclined to get the BME frame mount (S&W52-BWR) since it has to be removed if I want to remove the slide. 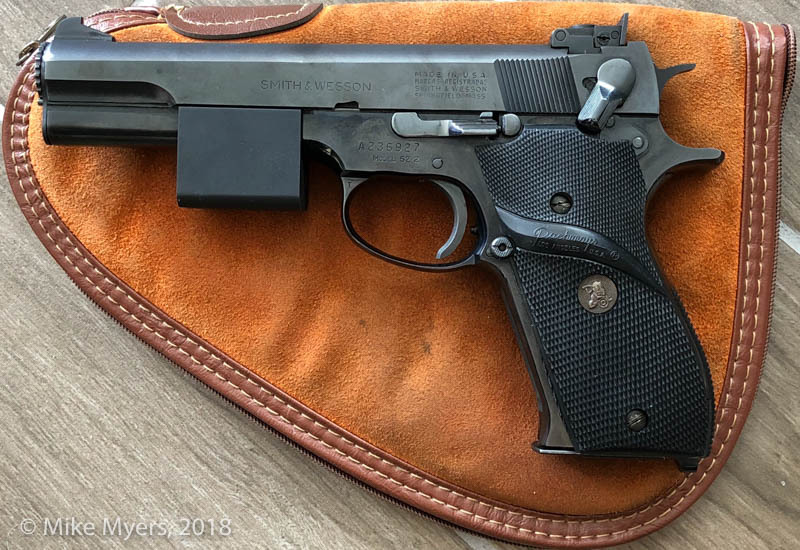 Instead, I'm looking at the S&W52-RR: http://www.bme-mounts.com/sw52-rr.html. I like that it would connect to my pistol's rear sight dovetail yet allow scope ring attachment to both ends of my full-sized red dot. Is there any advantage to getting a BME rear-sight mount that only connects to one end of my red dot sight (as in your first photo)? Also, where'd you get those lovely grips? I got the mount for the 52 to fit a Micro. I had a Holosun that I wanted to put on it. The Holosun gave me some problems so I put the full size on there to see if the mount or the scope was the problem. I shot the target with the cheapo Red Dot and realized the mount was fine and went looking for a different Micro. It handled the full size just fine and I could have left it on there but it handles the Vortex fine also. The ring I used for the full size dot was almost a double ring. Burris. The grips are Nills that I ordered from Mactec. Thanks for the great info! I’ve never seen a scope ring that wide. I’m curious: If I install the mount and red dot, and the gun then fails to cycle/feed, should I then change the powder charge or the recoil spring? I’m not sure how it works. They (Wolfe)make a reduced weight recoil spring kit you can buy from Midway and other places. I bought the kit then never had to use it. 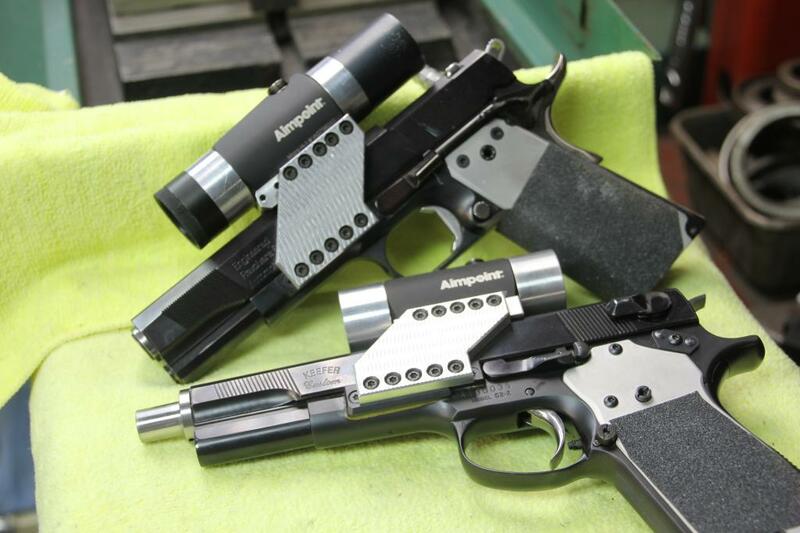 I have over 1000rds of ammo loaded for the pistol so changing load was never really an option.